Ok so I got my trans in and its running good now. Ran into an issue at a light when I tried to floor it and it just stalled. Did that a couple times before I figured out that I have to very lightly ease into it and once I'm going I'm good. I've adjusted the idle screw and the fuel mixture screws but honestly I've never really messed with a carb before. I want to get it to where its responsive and doesn't die. It's just a cruiser but I'd like to bring/use it for work (40 miles round trip) . Any tips, tricks, links to running the carb. Found the kit. Will be ordering it soon. Thank you. Opening the throttle wide open from a dead stop and not having the engine hesitate or stall is the hardest thing for a carburetor to do. There is a lot going on and everything about the natural way a carburetor works fights against being able to do that. Everything has to be just right in the carburetor for it to handle that. Little 1 barrel carbs seem to do it best. They handle being floored from a stop quite well usually. Yeah, it sounds like the accelerator pump is shot. Easy to see -- pull the air cleaner and look down the carb while you quickly open the throttle (or have someone sit in the car and mash the gas pedal). You should be able to SEE some fuel squirt into the carb. If not, accelerator pump is bad. Easy enough to install a carb kit. One thing to not, don't use spray brake or carb cleaner inside the carb! It will swell the seals and render them useless. That spray carb cleaner is only intended to be used on the OUTSIDE of the carb. You can get a gallon can of carb cleaner that has a little basket for small parts in it. It's intended to put the carb parts in and let them soak a few hours/overnight. You can use the spray cleaner to blow out passages with the carb apart. It evaporate quick enough that you can blow out, make sure there's no liquid pooled anywhere, wait a couple minutes, then assemble without worrying about messing up the accelerator pump. If you have compressed air available that's better for blowing out passages. Just wear safety glasses -- some holes that look like through passages are blind holes and stuff blows back in your face. Can burn the eyes... need to ask how I know? "Yeah, it sounds like the accelerator pump is shot. Easy to see -- pull the air cleaner and look down the carb while you quickly open the throttle (or have someone sit in the car and mash the gas pedal). You should be able to SEE some fuel squirt into the carb. If not, accelerator pump is bad. " I did test the accelerator pump and it does give fuel. Tweaked it a little more and its a bit better. I ease into it now and it feels smooth. For now it'll do. Brought it to work and she did need brakes though. That'll be this next weekend project. 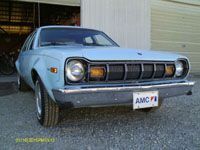 It is on a 1969 AMC Rambler 2 DR with a 199 3.3L I6.